Last night, as I was busy taking care of my sick baby, I got a tweet that made me want to cuss. At the time, however, my baby girl was the focus. No sooner than I dismissed it from my mind, my girl Dwana, responded to the woman and set her straight in her kind, gentle way. 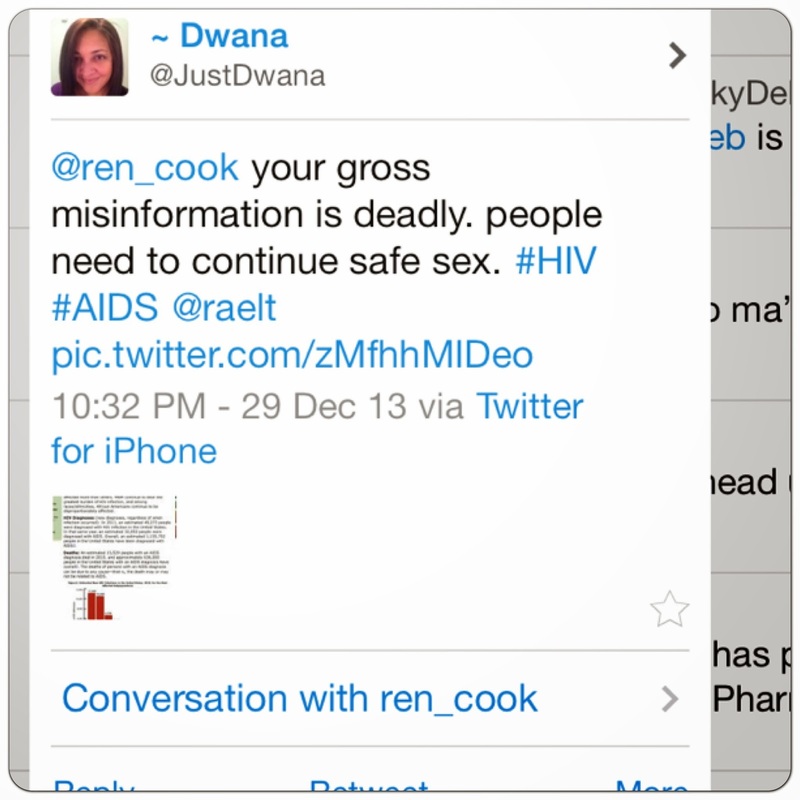 The woman should count her blessings that the first response was from Dwana and not me. 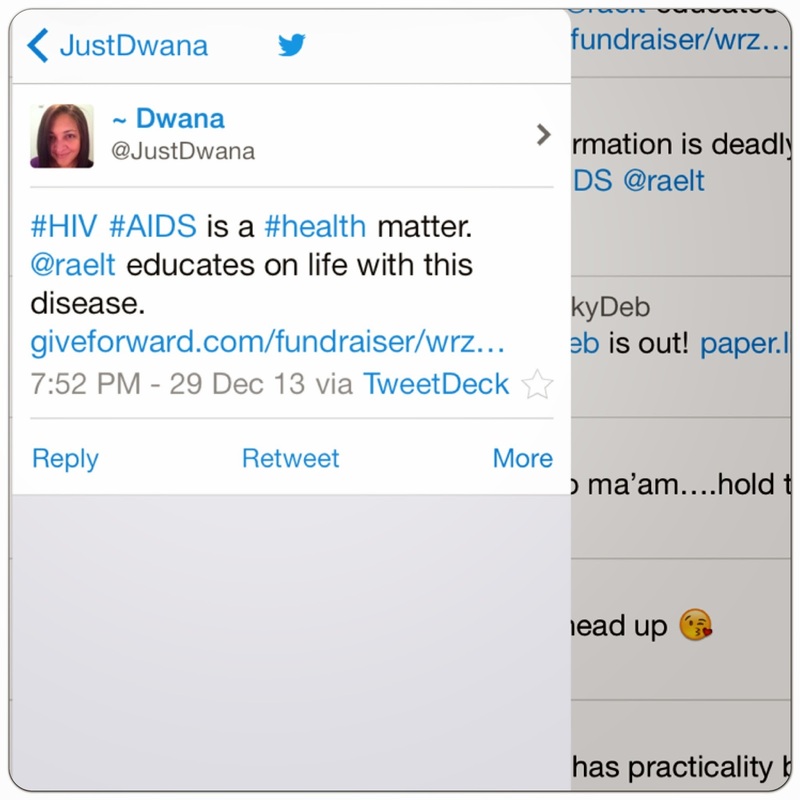 This is what happened: Dwana tweeted about the GiveForward Life Fund she organized on my behalf. 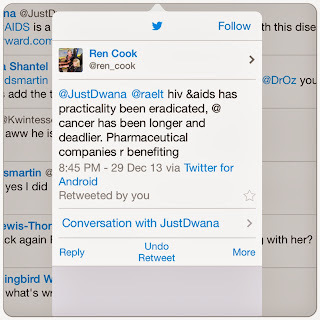 Then someone tweeted to me, and Dwana, that HIV/AIDS has practically been eradicated. My gut reaction was a curse deep within but I let the moment pass and this morning I tweeted in response to her misinformation and I didn't curse! But, I wonder how many people share this woman's view. 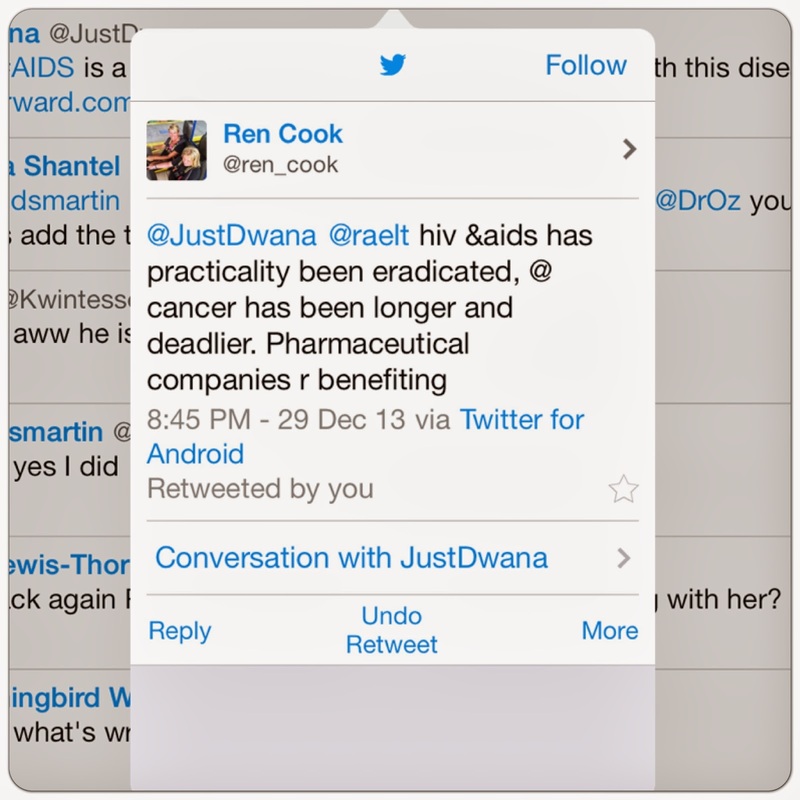 I wonder, how many people really think that HIV is no longer a big deal. I wonder how that affects behavior and if that is a factor in the continued new infections globally. People think either, they won't get it or if they do all they have to do is pop a pill. Setting this thought aside for the moment, the thing that really left me puzzled about this woman's tweet is that her Twitter profile says that she is an advocate for Autism; her son is Autistic. This is a woman who deals with health challenges everyday. So why would she dismiss someone else's pain and write their illness off to simple pharmaceutical companies profit? I wondered what portions of the medical community benefits from her son's condition and how she would feel to be dismissed as simply a profit. I've never been one to dismiss someone else's journey. Pain is pain no matter how different the pain may be. Then I wondered did she even click on the link that Dwana tweeted about me and the GiveForward Fund or did she just casually tweet Dwana. I wondered if she had read about me and my work if she would have had a different opinion ... or maybe she did read about me and still had the same narrow opinion. Then I wondered who on her timeline agreed with her tweet. I've learned that like-minded people tend to follow each other on Twitter. As the saying goes, 'birds of a feather flock together'. 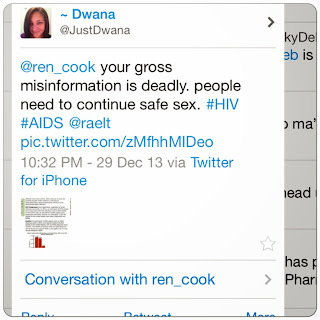 I don't know this woman but I know that she is ignorant to the facts of HIV/AIDS. Maybe she spends so much time dealing with her son's health, she doesn't have time to read. But you would think that if a person really doesn't know what they are talking about they would keep their damn mouth closed. I utterly dislike people who spread ignorance with authority. The fact of the matter is, every 10 minutes a person becomes infected with HIV in the United States. 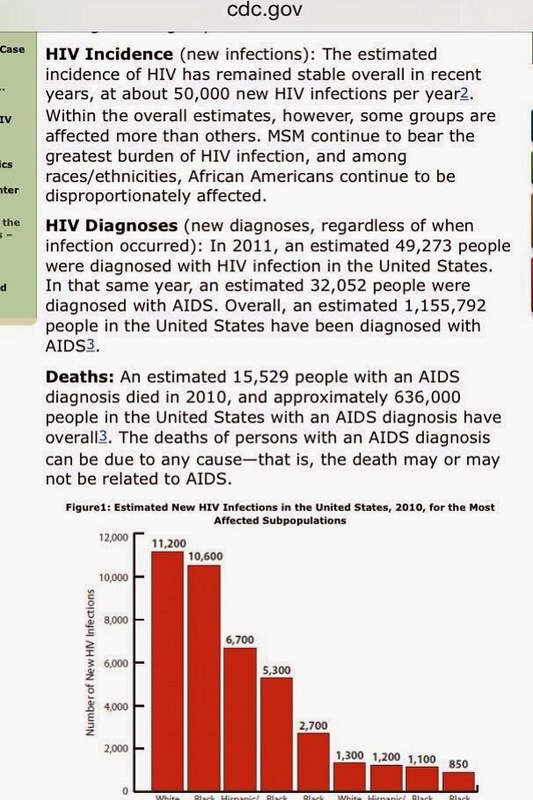 The fact is, CDC estimates 47, 500 new cases of HIV in the United Sates in 2010. 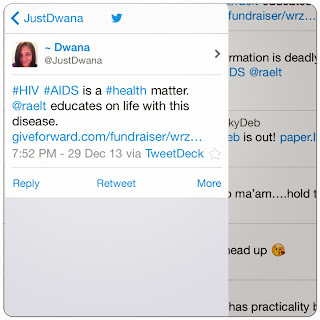 The fact is, each person living with HIV has their own health struggles with this disease. While there are similarities, there are also extreme differences. For example, some people take one pill a day, others like me, take 15 pills a day. 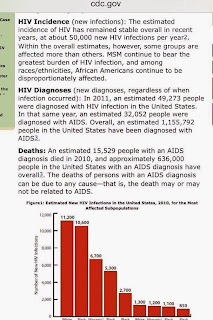 The fact is, 15, 500 people died in the United States from AIDS in 2010 and CDC estimates 635, 000 have died since the beginning of the pandemic. Worldwide there were 2.5 million new cases of HIV in 2011 with about 17 million deaths in 2011 and an estimated 34 million living world wide. The fact is, in addition to the health issues that come with HIV, people living with HIV have to deal with the shame, isolation, stigma and discrimination; I will never forget being denied that tattoo 7 years ago because I have HIV. We have to deal with fear of rejection and yes, actual rejection - not just the fear of it, and we have to live with being dismissed by people like Ren Cook every day of our lives. Post Script: There are 15 more hours to donate to my GiveForward Life Fund. The fund will end at 12:00 Midnight today. Again, I receive all the funds less 7% in 5 days. 5% goes to the GiveForward for operations and 2% goes to credit card fees. Again, thanks to everyone who has donated so far. I'm touched by your sacrifice - but your comments have made my life sacrifice even more meaningful. Thanks for sharing... Click Here to Donate!